Sometimes things are going well, but we still need to push the boundaries. Our previous website served its purpose and worked great. That said, it was time to take it and the whole freight industry to the next level. So that’s what we just did! Even our developers were excited to work with the new design! We’re serving businesses with instant freight quotes and online bookings, and we’re unveiling break-through redesign. 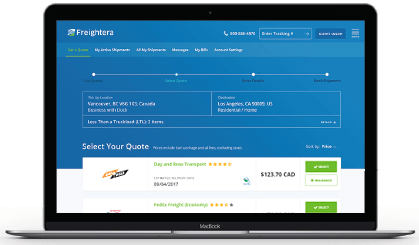 Freightera users can now get live instant quotes without login or registering. New site features responsive design and for the first time offers quotes and booking on mobile devices. Freightera also opened limited availability of automated orders of refrigerated and full truck load freight online. Enough said – there’s no better way than experiencing new Freightera. Your feedback is precious to us. Please comment below or send us your feedback by email. We will be happy to receive any comments to keep improving your experience! Also, we need your help spreading the word out. Please share this big news via email and social media as we greatly appreciate it. * In case you wonder, Level 9 was the code name of this redesign.